I tried searching but did not find anything conclusive. I'm trying out the 1Password manager and so far everything looks great. However I do have a possible deal-breaker for me and that is support for Firefox on Android. I have Android 8.0.0 and the 1Password app and everything works absolutely fine in Chrome, but not at all in Firefox. I do have both filling options enabled (autofill and accessibility) and the app just does not trigger at all in Firefox. Is there any way to make this work? Is this even implemented? I found some posts mentioning a 1Password keyboard, but I want to keep using the keyboard I have now and I'm not even sure this is still supported. Hi @Keksa. Thanks for reaching out. 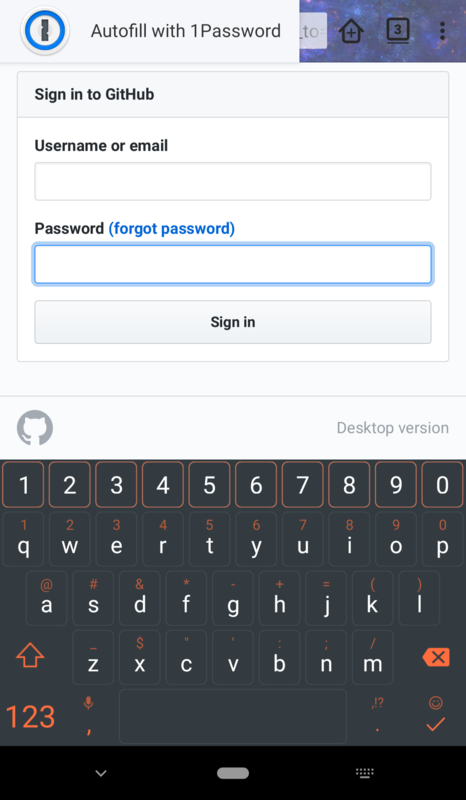 Currently, 1Password isn't able to fill in the Firefox mobile app, as it doesn't support Autofill, and our accessibility service doesn't work there. However, they have added Autofill support in the beta and nightly versions, so that will be coming soon (and is supported in our beta version as well). If you're feeling adventurous, install the Firefox beta app, and switch over to our beta channel, and let me know if that helps! I have the beta of Firefox and 1password, and the "Autofill" button seems to always show up at the top of the screen. @burn123: I haven't seen the thing with it showing up at the top like that, but the latter is a known issue with Firefox. Note that the URL it's sending is "comgithub.com" and not "github.com" like it should be. That's why your actual GitHub login isn't being offered: the URL doesn't match the (incorrect) one Firefox is giving Autofill. Hopefully that will be addressed in a Firefox update. I haven't checked the beta or nightly channel recently, so it's possible it already is there. @brenty But for Chrome filling, it allows you to search your vault, can that be done with Firefox as well? @burn123: Chrome does not work with Autofill yet, so you're literally associating a Login item with Chrome. With Autofill, the browser gives the actual URL to 1Password so it can not only give you the right Login, but also not offer to fill the wrong one.